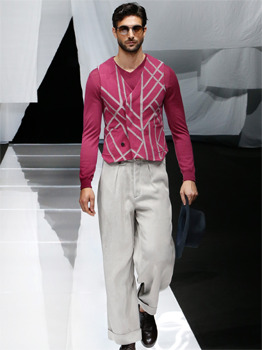 In his constant search for elegance for men, Giorgio Armani moves forward a step at a time, overcoming codes and traditions and proposing new solutions elegantly anchored to the contemporary world. And in a subtle game of variations on a theme, he sketches a figure that is loose and genteel, yet also free and mindful. In this way the double-breasted jacket " the star of this collection " sistances itself from the idea of a stiff and classic piece, and discovers a surprising versatility. Offered in different fabrics and patterns, the jacket takes on a soft, formal appearance, acquiring the sporty look pf a blouson, or becoming a garment to be worn casually on the beach. Dimensions are re-worked, with shoulders that highlight the slightly over-sized proportions, and the outfit is completed with widebottomed trousers, always marked by turned-up hems. The loose, calibrated look is characterised by the addition of a waistcoat, which, in its tailored or more casual version, replaces the more common crew-neck sweater. The chromatic spectrum shuns strong, clear colours in favour of varied light shades, ranging from chalk white to hemp grey, interspersed with blue and accents of turquoise, jade green and powder blue, always seen through a sandy filter. The lightweight surfaces play host to a multitude of abstract patterns, muted by the clean contours and subtle colours that enhance the elegant naturalness of the concept.